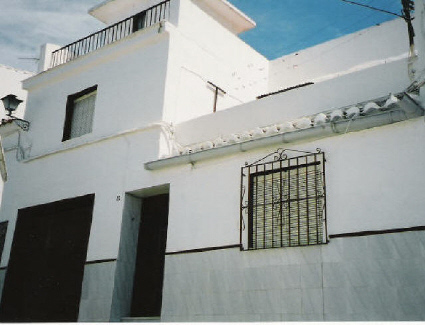 A traditional 3 bedroom village house in the heart of the old quarter of Velez-Malaga within 5 minutes walk of local shops, bars and restaurants. The nearest beach at Torre del Mar is a 7 minute drive away. In our opinion: This house will suit a family or group looking for a different holiday within a very Spanish environment. The steep streets of the old quarter make it a difficult location for those with mobility problems. Bedroom 1: Spacious double bedroom furnished with double bed, drawers and hanging space. Bedroom 2: Good size bedroom with double bed and wardrobe. Bedroom 3: Twin beds and hanging space. Kitchen: Good size well equipped kitchen with oven, hob, fridge-freezer, washing machine and dishwasher. A toaster, kettle and coffee-maker are also provided. Lounge: Nicely decorated spacious lounge with two comfortable sofas, colour TV with English satellite channels and CD player. Bathroom: Modern family size bathroom with bath/shower, toilet and basin. Outside Area: Shady internal courtyard with table and chairs leads up to a sunny west facing roof terrace with sun loungers and bbq area with views to the mountains and the sea. Special Note: Although the house is accessible by car it is not always possible to park close to the property. However there is plenty of parking available 5 minutes walk away. If you would like to check the availability of this property please fill in the form below. We will then check with the property owners whether the dates you require are available and notify you by e-mail within 48 hours.